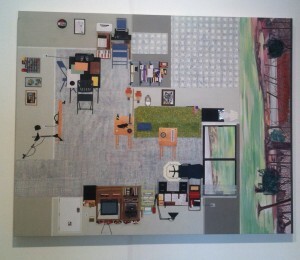 At a recent art fair I discovered the work of Ann Toebbe, who makes paint-and-collage images of domestic spaces. I found them strangely satisfying, for all sorts of reasons. The images are constructed out of tiny, colorful slips of paper and meticulously-rendered passages of paint or pencil or ink. The craftsmanship drew me in, and I lingered over all the details, enjoying the way the image coheres out of so many small points of near-abstraction. Then, I began piecing the room together, following the various viewpoints the artist depicts: bird’s-eye; 45-degree; straight-on. You can’t see the whole room at once – you have to cast your eyes around, taking it all in. Of course, this is how we always perceive a space. Finally, I realized I spark to all this precision in the service of capturing the ineffable. I love that we see Jim’s toy car collection and the nubby sofa cover and the notes scattered on the desk. All these objects furnish Jim’s Studio – these are the components of creativity.